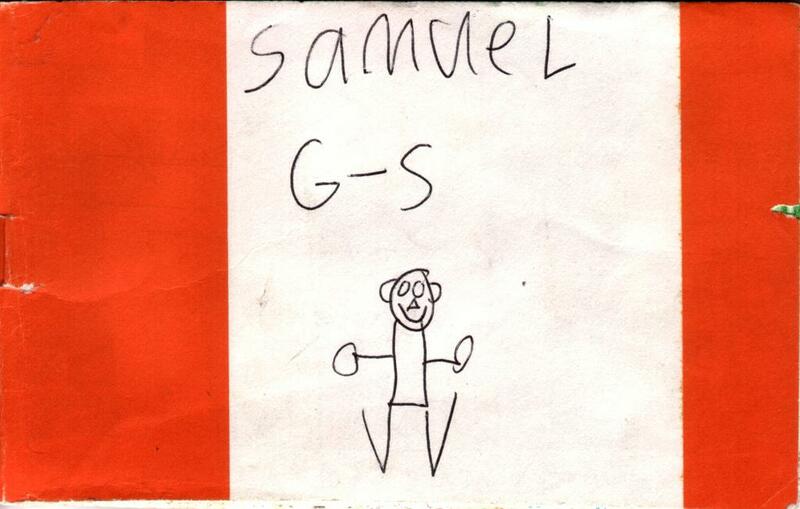 The Samuel’s Artwork series continues now with a series of pictures titled “Samuel In Dolgnwot”. 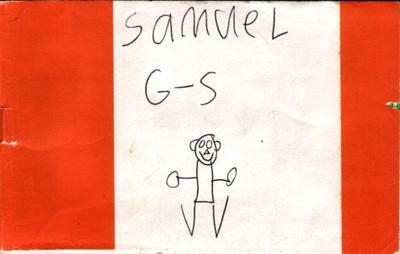 Samuel In Dolgnwot was a series of pictures I drew in Year 6 (1999) during a unit of school work called “The Gold Game”. As part of this we had to keep a diary, and rather than write my diary, I drew it, and this series is those drawings. The drawings mainly consist of my “patchwork art” which was my style at the time, I will explain the process I went through to create the images at a later date. I intend on running one episode per day, so stay tuned for the full series of Samuel In Dolgnwot. The first picture was the cover of the book, and it is an artwork itself. While I was drawing these pictures I decided that it was a TV series, and as such, each picture is an episode. 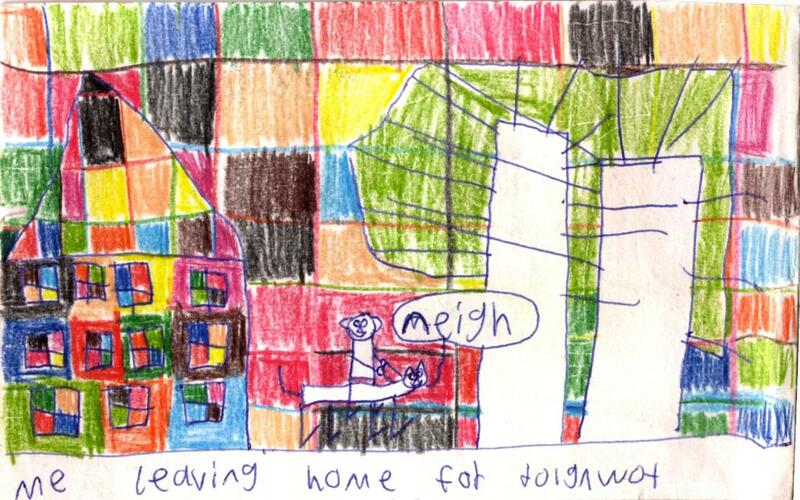 The episode you see here is the pilot episode where I leave home for the goldfields. Despite the fact that this is the first picture in the book, it was, in fact, the last picture drawn in the book. I made the plot for the pilot episode long before I drew the picture. Anyway, the basic outline of the story is that I live in the forest of Canberra in the mid 1800’s (Long before Canberra actually existed, and history shows that Canberra was not a forest, but for the purposes of Samuel In Dolgnwot it was) and my house is very futuristic for its time, containing most of the modern conveniences of 1999, however money is starting to become scarce and as such, I leave for the goldfields in order to make some extra money. In this particular episode, I am just about ready to leave when my mischevious housemates (various animals) hide my luggage and make me go on a mystery hunt through the house, following the clues they have left behind, to find my luggage. Eventually I find the luggage and head for the goldfields on my horse. Clicking on the pictures will show larger versions, you can also find them on the photo gallery.